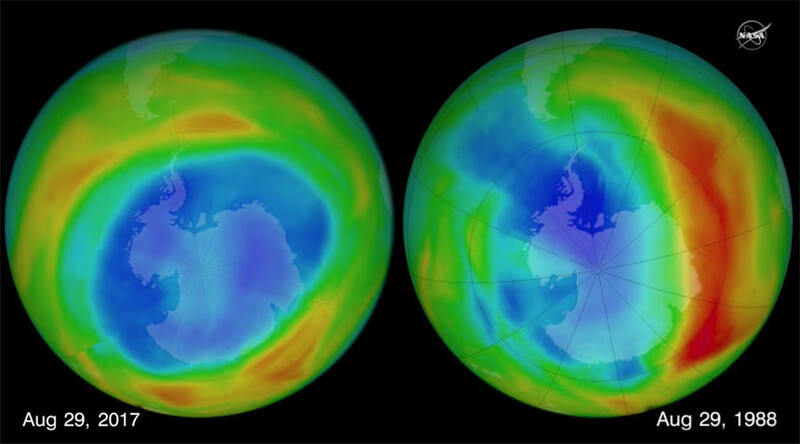 The ozone layer shrank to its smallest size since 1988 in 2017, NASA has confirmed. They currently attribute the shrinkage to an increase in air temperatures across the globe. NASA's Aura satellite and the joint NASA-NOAA Suomi National Polar-orbiting Partnership satellite measure ozone in Earth's atmosphere from space. "In the past, we've always seen ozone at some stratospheric altitudes go to zero by the end of September," said Bryan Johnson, an atmospheric chemist with NOAA. "This year our balloon measurements showed the ozone loss rate stalled by the middle of September and ozone levels never reached zero." A team of scientists at NOAA monitors the thickness of the ozone layer relative to a station at the Earth's South Pole using a series of weather balloons, carrying specialist measuring equipment, along with a ground-based instrument called a Dobson spectrophotometer. The Dobson device measures the amount of ozone in a vertical column of air that extends from the Earth's surface to the edge of space in the upper atmosphere. A Dobson unit is defined as the number of ozone molecules required to create a .01mm-thick layer of pure ozone at a temperature of 32 degrees Fahrenheit (0 degrees Celsius) at an atmospheric pressure equivalent to that at ground-level. During the 1960s, before the hole in the ozone layer appeared, average ozone concentrations above the South Pole ranged between 250 and 350 Dobson units. On September 25, 2017, the concentration reached a minimum of 136 Dobson Units, the highest minimum since 1988.